The location-based method is meant to communicate the reality of emissions from the electric grid to which an institution or organization is tied. For practical purposes, reporting using the location-based method entails using regional emissions factors (i.e., E-Grid.) Most institutions already use this method to determine Scope 2 emissions from purchased electricity, so this will not represent any change. A bigger change is the requirement to also report using the market-based method, for institutions that procure renewable energy. The market-based method takes into account all the various ways in which institutions purchase off-site renewable energy (e.g. unbundled RECs, power purchase agreements, utility pricing, etc. ), and essentially subtracts the kWh-equivalent of the institution’s entire off-site renewable energy portfolio from the volume of purchased electricity before applying an emissions factor to the number of kWh purchased. The result is that the reductions in carbon emissions driven by renewable energy procurement are reflected in the institution’s Scope 2 emissions total from the outset, rather than being subtracted from the carbon footprint after the fact and communicated as a difference between gross and net emissions. What does this mean for signatories as they complete their 2017 Annual Progress Evaluation? 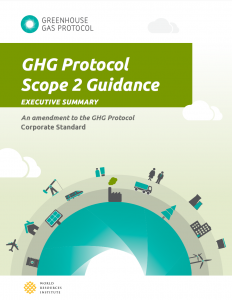 In the updated Reporting Platform, Second Nature asks signatories to enter the results of the “market-based method” for Scope 2. To align with that change, the “Emissions Reductions for RECs” carbon equivalent data field that had been part of the previous GHG inventory report has been removed. For schools that do not hold any RECs from off-site renewables, you can report your Scope 2 emissions just as you have in the past (assuming you are using an E-Grid default emissions factor). For schools that do procure renewable energy (from their utilities, PPA’s, unbundled RECs, or any other sources for which RECs are retained), you will need to make sure that the Scope 2 number that you enter already has those RECs taken into account. Enter the total number of RECs that your campus owns into column DQ on the input sheet. Leave the electricity input (column BX) as is. Make sure the proper E-Grid regions are chosen and that Custom Fuel Mix is not selected. Subtract the number in column S from the number in Column G.
– On the “2. 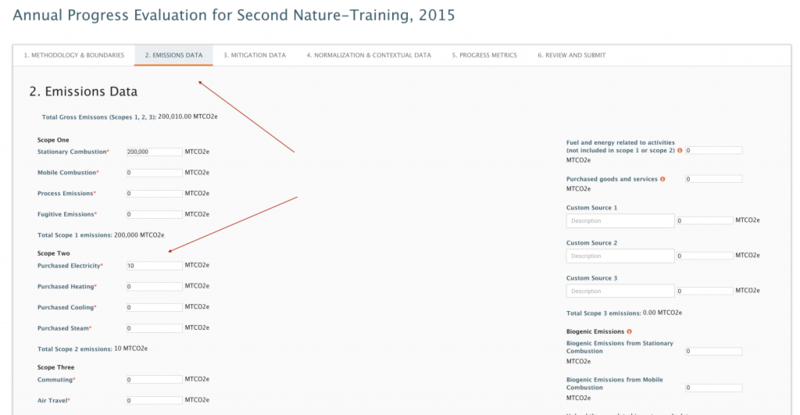 Emissions Data” page in the form – enter the resulting figure from step 3 above into the “Purchased Electricity” data field under the “Scope Two” heading. The total Scope 2 emissions from purchased electricity that CarbonMAP generates on the dashboard will then be the emissions total you should enter in the “Purchased Electricity” data field under the “Scope Two” heading on the “2. Emissions Data” page of the Annual Progress Evaluation in the Second Nature Reporting Platform.